Last week I mentioned that I had found two news articles of interest at British Newspaper Archive. This week I am sharing the second. 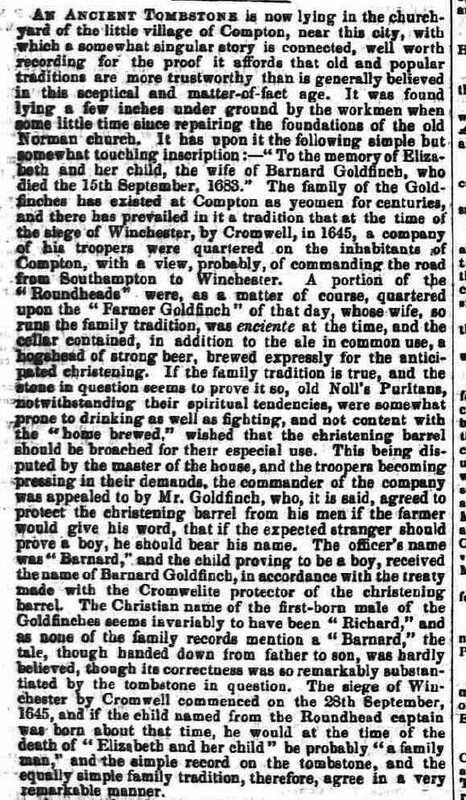 The below was found on page 7 of the Hampshire Advertiser - Saturday February 6, 1854. It describes the discovery of a tombstone corroborating a local legend. AN ANCIENT TOMBSTONE is now lying in the churchyard of the little village of Compton, near this city, with which a somewhat singular story is connected, well worth recording for the proof it affords that old and popular traditions are more trustworthy than is generally believed in this skeptical and matter-of-fact age. It was found lying a few inches under ground by the workmen when some little time since repairing the foundations of the old Norman church. It has upon it the following simple but somewhat touching inscription:-- “To the memory of Elizabeth and her child, the wife of Bernard Goldfinch, who died the 15th September, 1683.” The family of the Goldfinches has existed at Compton as yeomen for centuries, and there has prevailed in it a tradition that at the time of the siege of Winchester, by Cromwell, in 1645, a company of his troopers were quartered on the inhabitants of Compton, with a view, probably, of commanding the road from Southampton to Winchester. A portion of the “Roundheads” were, as a matter of course, quartered upon the “Farmer Goldfinch” of that day, whose wife, so runs the family tradition, was enciente at the time, and the cellar contained, in addition to the ale in common use, a hogshead of strong beer, brewed expressly for the anticipated christening. If the family tradition is true, and the stone in question seems to prove it so, old Noll’s Puritans, notwithstanding their spiritual tendencies, were somewhat prone to drinking as well as fighting, and not content with the “home brewed,” wished that the christening barrel should be broached for their especial use. This being disputed by the master of the house, and the troopers becoming pressing in their demands, the commander of the company was appealed to by Mr. Goldfinch, who, it is said, agreed to protect the christening barrel from his men if the farmer would give his word, that if the expected stranger should prove a boy, he should bear his name. 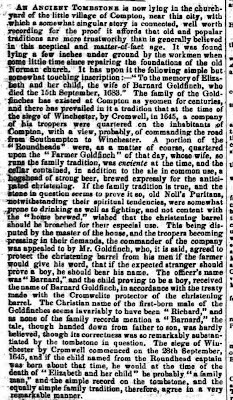 The officer’s name was “Barnard,” and the child proving to be a boy, received the name of Barnard Goldfinch, in accordance with the treaty made with the Cromwelite protector of the christening barrel. The Christian name of the first-born male of the Goldfinches seems invariably to have been “Richard,” and as none of the family records mention a “Barnard,” the tale, though handed down from father to son, was hardly believed, though its correctness was so remarkably substantiated by the tombstone in question. The siege of Winchester by Cromwell commenced on the 28th of September, 1645, and if the child named from the Roundhead captain was born about that time, he would at the time of the death of “Elizabeth and her child” be probably “a family man,” and the simple record on the tombstone, and the equally simple family tradition, therefore, agree in a very remarkable manner. 1) My fourth great grandparents, William Denyer and Jane Goldfinch, were married in 1791, and one of their sons would be named Barnard Goldfinch Denyer. I found the will of a Barnard Goldfinch dated 1789 and mentioning a daughter named Jane. (Transcription of will). However, due to the family legend, by the 18th century there were probably multiple Barnard Goldfinches, whether or not they were directly descended from the one mentioned in the legend. There could even have been two Barnard Goldfinches with daughters named Jane. 2) From a genealogist perspective I like how the discovery of the tombstone is used as 'proof' for the family story. Naturally, one could argue the proof isn't complete, but it certainly does lend credence to the story. 3) From the perspective of an American, this legend is a good example of why the Third Amendment to the US Constitution was written. "No soldier shall, in time of peace be quartered in any house, without the consent of the owner, nor in time of war, but in a manner to be prescribed by law."